The Octopus ring technology was introduced to the marketplace over 30 years ago and has been an example of optimized stretch wrapping ever since. With a complete range of stretch wrapping machines and options to meet the load containment needs of our customers, Muller continues to be an industry leader and innovator. The inherent flexibility of rotary ring stretch wrap technology provides the best load containment possible at the lowest cost per load (film savings of up to 25% are possible versus traditional rotary arm stretch wrappers). Versatile, modular, cost effective, operator-friendly and high speed, are all applicable descriptions of Octopus stretch wrapping systems. Each stretch wrapper series was designed with the manufacturer in mind. This fully automatic aluminum frame stretch wrapper provides high speeds at an affordable price. Simple installation allows customers to be up and running in quickly. With the easy to thread “S” film carriage, Octopus stretch wrappers boast lower system wear with significantly lower total cost of ownership with respect to competitive stretch wrapping systems. The compact design of the “C” Series Octopus stretch wrapper is perfect for those facilities that require a minimal stretch wrapper footprint. It is fast and versatile with a variety of options available based on needed specifications. This stretch wrap machine also features our “S” design film carriage, which allows for the highest level of pre-stretch and simple to use stretch wrap threading. This steel frame stretch wrapper design handles speeds of up to 130 loads per hour. With quiet production and minimal maintenance required, it is the perfect system for dependability and speed in your stretch wrapping system. With an integrated system, the “S” Series requires less assembly than other stretch wrapping systems in the marketplace today. 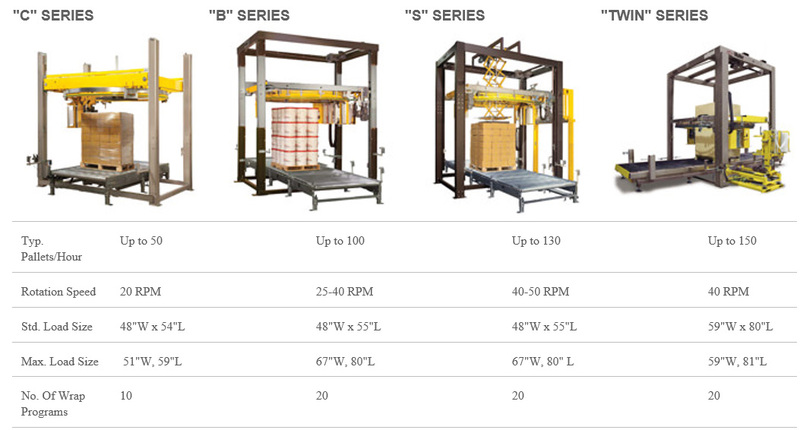 Customize your wrapping program with the TWIN series; the pinnacle in high speed stretch wrapping .Boasting “TWIN” film carriages, both film payout systems are reactive to the load design, minimizing film consumed while maximizing load containment. The TWIN Series stretch wrappers handle high speed throughput, eliminating bottlenecks, helping your plant reach its’ goals. Easy installation and minimal maintenance ensures high productivity.